Preheat oven to 375F. Combine flour, sugar, baking powder, soda, cinnamon, allspice, and crystallized ginger. Cut cold butter into pieces, and add to dry ingredients. Cut butter into dry ingredients with pastry cutter. Do not over mix; butter should be the size of lentils. In another bowl, beat 1 egg and vanilla into 3/4 cup buttermilk. Add liquids to dry mix, and gently combine with pastry cutter. Add currants as desired. On a floured surface, knead dough lightly until soft, not sticky. (Have ice water ready to add 1 tsp. at a time if mixture is too dry.) Roll to 1/2 into thick. Cut with floured cutter. Repeat until all the dough is used. Place on cookie sheet lined with parchment. 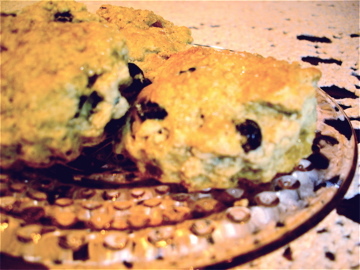 Whisk 1 egg with 2 tablespoons water, and brush over unbaked scones. Sprinkle with raw sugar if desired. Bake 15 minutes or until tops are golden.